Whether you're a re-usable grocery bag kind of person, a fashionista, or someone who likes a bit of style with their functionality, this DIY leather bag project is for you! Reusable grocery bags are a must, but a grocery bag made out of an old t-shirt is, well, a slice of re-use heaven. I particularly like the airy quality of this bag, which, seriously, does NOT look like it began its life as a t-shirt. Tutorial: Sewing a Mini-Drawstring Bags. With no measuring, a quick turn-out time, and an infinite number of uses, there's every reason to try your hand at making one of these mini-drawstring bags designed by Jessica Gonacha for IndieFixx. Recycled Juice Pouch Lunch Bag. Like or not, it's the end of August, and with the season comes all sorts of options for DIY Back-To-School fantasticness. This Recycled Juice Pouch Lunch Bag is a great project to do with back-to-schoolers, or just as a good luck present. It can teach them about recycling and reuse, provide a great introduction to sewing, and provides for a pop art lunch toter that beats the pants off of wasteful brown paper sacks. Vane Becidyan, the Brooklyn Bride, in collaboration with Etsy's How-Tuesday, offers this video tutorial for making fabric drawstring bags for big impact for party/wedding/shower favors. And when they've pulled the string and discovered their goodies, the wrapping still remains part of the gift: a reusable, handmade, colorful gift. Tutorial: How To Use Metal Rivets. Lisa from U-Handbag offers a detailed tutorial on using metal rivets. Her well-photographed overview offers tips on tools, technique, and application. Just a bit of knowhow, and all sorts of possibilities. Via. Ornj Bags: Recycled Construction Fencing Goes Fashionable. "Detroit-based designer David Shock...has cleverly found a way to repurpose discarded day-glo construction fencing into one-of-a-kind totes for market and around town shopping. Ornj Bags are not only eco-friendly, but also a smart way to keep the neighborhood tidy and vibrant with street fashion that allows you to go green for the long haul!" Clever, eyecatching, and quite DIYable. "The next time you're asked if you want a paper or plastic bag at the grocery store, you will be able to politely decline and then put your goodies in this handmade shopping bag. Strut out of the store with DIY pride!" Etsy video teamed up with BurdaStyle for this great video podcast on making the open source Charlie grocery bag. Scan this messenger bag created entirely from 3.5" floppy disks and (what looks like) jump rings.Oh, and a strap. There's also a short how-to video so you can makes your own. Cool, cool. How to Easily Convert From Plastic Grocery Bags for $1.00. 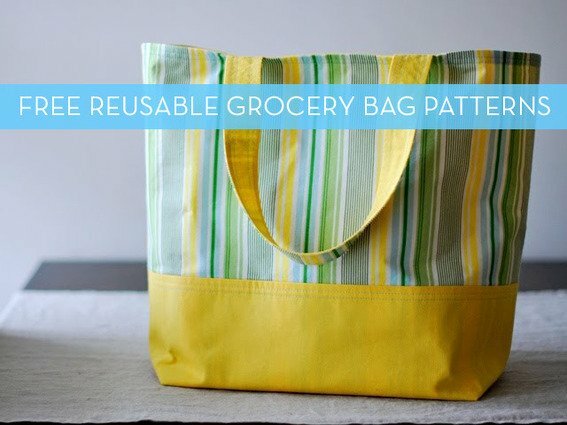 You've been meaning to gather enough re-usable grocery sacks to do away with plastic bags all together, but you just can't find the time to sew them all, and can't bring yourself to pay $8-9 for commercial products.